Ben Bernanke delivered a much anticipated speech today at the Jackson Hole Economic Symposium. Many observers, myself included, were wondering if he would advocate a more aggressive role for monetary policy given the signs of weakening in the U.S. economy. Instead, what he delivered was a big tease: he acknowledges three points made by advocates of more monetary easing, but then either ignores the implications of these points or argues against them. [A]llowing the Federal Reserve's balance sheet to shrink in this way at a time when the outlook had weakened somewhat was inconsistent with the Committee's intention to provide the monetary accommodation necessary to support the recovery. Moreover, a bad dynamic could come into at play: Any further weakening of the economy that resulted in lower longer-term interest rates and a still-faster pace of mortgage refinancing would likely lead in turn to an even more-rapid runoff of MBS from the Fed's balance sheet. Thus, a weakening of the economy might act indirectly to increase the pace of passive policy tightening--a perverse outcome. Consider the implications of these points. First, if lower interest rates reflect economic weakness--though he mentions long-term interest rates recall they are the expectation of a bunch of short-term interest rates plus some term premium--then one implication is that the low federal funds rate may not be so accommodative after all. Given the state of the economy, maybe the 0%-0.25% range for the federal funds rate is not low enough. Now the federal funds rate cannot go negative (and this is one of the problems with using an interest rate target), but if it could the implication here is that it may need to go deep into negative territory in order to be at the appropriate level. Folks like Andy Harless and Glenn Rudebusch have made this very point. So what does Bernanke think? Does he run with his own argument to its logical conclusion? The answer is no. Elsewhere in the speech he claims that "monetary policy remains very accommodative" and that the "Fed has also taken extraordinary measures to ease monetary and financial conditions. Notably,... the FOMC has held its target for the federal funds rate in a range of 0 to 25 basis points..." In short, Bernanke thinks the low federal funds rate is sufficiently accommodative, even after acknowledging that low interest rates can reflect weak economic conditions rather than loose monetary policy. Now consider his second concession: the Fed can effectively be tightening monetary policy just by being passive. He acknowledges this point in the context of stabilizing the Fed's balance sheet. This is an important insight, but what about the other ways the Fed can passively tighten monetary policy? Currently, the Fed is failing to stabilize the NGDP or aggregate demand forecast. By allowing this to happen the Fed is effectively tightening monetary policy. Why is he not concerned here too about such passive tightening of monetary policy? A rather different type of policy option, which has been proposed by a number of economists, would have the Committee increase its medium-term inflation goals above levels consistent with price stability... in such a situation, higher inflation for a time, by compensating for the prior period of deflation, could help return the price level to what was expected by people who signed long-term contracts, such as debt contracts, before the deflation began. How can there be any question about falling inflation expectations? (For those concerned that the liquidity premium is distorting the implied expected inflation rate from the Treasury market note the following. First, the Cleveland Fed data corrects for this potential distortion. Second, even in the case of the chart above a heightened liquidity premium only reinforces the likelihood of growing deflationary pressures. This is because a heightened liquidity premium implies a heightened demand for highly liquid assets like treasuries and money. In turn, this implies less spending and greater deflationary pressures.) Third, if there is anything driving increased uncertainty it is a weakening economy. And by failing to stabilize inflation expectations, the Fed is allowing economic uncertainty to grow. Bernanke seems hung up on a potential source of economic uncertainty instead of looking to an actual source of economic uncertainty. 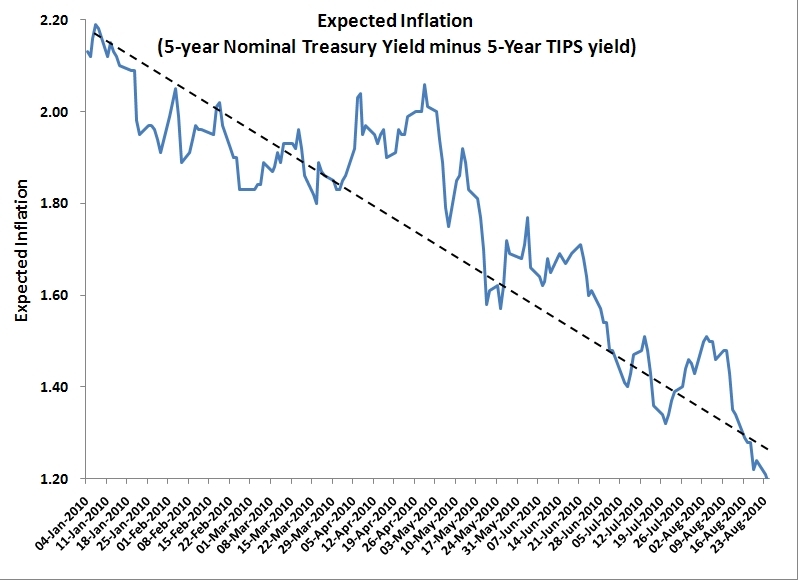 The y axis exaggerates the fall in inflation expectations. Scale it from -2% to +6% and this pseudo issue goes away. The fall can be dated to the troubles in Europe and so it has less to do with the pricing of domestic output than otherwise appears to be the case. The economy is in sad shape but other than fanning the fires of stagflation there is little the fed can accomplish. I believe monetary policy is too tight but only minor adjustments are necessary. Stop paying an above market interest rate on excess reserves. Redirect QE to purchases of higher risk tranches of newly issued securitized debt. Buying 30 year T bonds and creating excess reserves is pointless. They would be simply exchanging one form of liquid, default-risk free, proprietary information-insensitive asset for another. This change in policy would help slightly on the margin. There has been a steady decline from January through the present. It is far more than just a Europe shock. This is evident if one looks at NGDP foredcasts--they are headed down too. We can change the scale, but the fact remains the 5-year expected inflation rate is about 100 basis points lower than it was in January. Moreover, this is borne out in Clevleand Fed data. Gauti Eggertson had a paper out about a year ago, I think called "Great Expectations". He argued that the Depression was ended by radical regime change under FDR. Its hard to believe that buying a few more T-bonds is going to do much to change expectations. Bonds and money are v.close substitutes anyway. What would do it ? Announcement of large fiscal expansion (remember, WW2 did the trick but we can find better ways). Raise taxes on the rich and use funds to pay for education for the poor. Raising taxes on rich also has the salutary effect of crimping the crony capitalist stranglehold on Congress. Institute dramatic financial reform. Admit that the big banks are broke (no more extend and pretend, ) and nationalize and break apart. Aggressively prosecute the mortgage fraud of 2003-2006. Send large number of fraudsters such as Mozillo at Countrywide to jail. 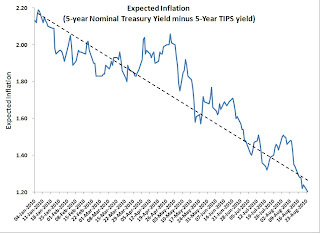 The beauty of fiscal expansion is it would also probably raise inflation expectations - isnt that one of your faves? I learned from living in the UK under Thatcher that radicalism is the way you break free from stagnation. America today is in desperate need of radicalism. Great stuff for your finance students! The cure for expected deflation is to let the price level fall. Government policy is obstructing the massive adjustments in relative prices that are necessary to restore the economy to health. Specifically, we need an expedited process for foreclosures and an expedited process to recapitalize unsound banks. Seriously, can we restore balance to the economy by goosing the price of medical care, university tuition, beer, lumber, copper pipe, cement, fiberglass insulation and gasoline by an additional 1% per year? When we talk about deflation we need to look at the components of the price level. What components of economic output are going down in price that are also inputs to the kind of investments we need to move the economy forward. Is the replacement cost of a refinery going down? A big part of the CPI is housing. How much general inflation would be necessary to get housing starts up to 1.2 million per year? 10%, 20%. There is deflation in housing because too much housing was built and price corrections are being obstructed by policy. We are better off with housing starts at .5 million for the next five years. I think it is fine for the fed to target NGDP. Such a policy would not have prevented this recession and it would not have a major impact on the recovery. The key to preventing a Japanese style lost decade is to speed up the structural adjustments to the US economy and to create an environment hospitable to investment. This is a microeconomic problem, not a macroeconomic one. The fiat currency system, at it's heart, is a system whereby currency is introduced into the system as debt thru a bank. It's a parasitic system set up to rob the working folk of a part of the fruits of their labor. It's also a ponzi system, currently in process of imploding. David: You should clarify Stock and Watson on why inflation in 2004 went up instead of down! Mr. Stock and Mr. Watson examined what has happened in seven recessionary episodes since 1960 when unemployment has shot higher. Economists have for decades tried to tease out the connection between inflation and unemployment. The common belief is that inflation falls as unemployment rises, and visa versa. But the connection hasn’t always held up, as in the 1970s. Mr. Stock and Watson changed the standard approach by looking only at the connection between inflation and unemployment in downturns. In the last half century, they find, a sharp rise in unemployment causes what they call an “unemployment recession gap” which pushes down inflation. There is an important outlier in 2004 to their findings. Their model predicts inflation would have fallen during the jobless recovery of 2004. Instead it rose by 0.7 percentage points. “We do not have an explanation for this increase in inflation,” they say. One possibility: In earlier periods, inflation fell after recessions in part because the Fed wanted it to in its drive to wipe out the inflations of the 1970s. By 2004, Fed officials were worried that inflation was too low and they promised to keep interest rates low in response. That might have helped to push inflation higher by pushing expectations for future inflation up. The Fed is in a similar spot today. "The key to preventing a Japanese style lost decade is to speed up the structural adjustments to the US economy and to create an environment hospitable to investment. This is a microeconomic problem, not a macroeconomic one." Exactly, and if we could get David to start hammering home on this one, with his academic credentials and influence in the profession, this would be a major plus. There are plenty of people who have been saying this, like Richard Fisher, William Black, John Cochrane but we need to get the message out more from respected academics. Once again, NGDP targeting and QE2 is second-order; financial reform and restoration of trust through prosecution of fraud is first-order. You obvioiusly have me confused with someone else--if only I were influential! But you and Charles are right on the important of structural reforms. My thinking is that if we can stabilize macroeconomic conditions then it creates an environment more conducive to doing structural reforms. I don't mean to be defeatist, but how likely is it we could ever get real reform in the banking system? The limited purpose banking idea is really growing on me, but how will it ever come about? Along the lines of Charle's comment, what may be more doable is some way to make expedite foreclosures and debt write down so that household balance sheets are repaired. Any suggestions? DB: well you are perhaps more of a realpolitik kind of person than I. Politics as the art of the possible. But still, dramatic reform is always possible, we know because it has happened before. South Africa shed apartheid, Russia got rid of communism, America had its civil war to get rid of slavery. In that context, banking reform shouldn't be so hard! Its a question of building pressure. Don't forget the incredible outrage the public showed in Sept 2008, which at least stopped the first attempt at TARP. And you do have some influence, right? PK reads your blog!